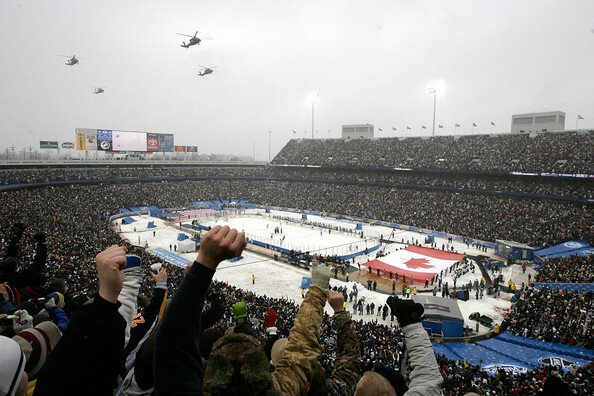 This is part one of a four part series in the different views of outdoor hockey games. I could have been there. Instead I had to pass. The day before New Years Eve I received a text from my good friend The Steve, "We have a free ticket. Drive up to Pittsburgh and it's yours. We'll take you to Buffalo." Living in Charleston, SC this wasn't going to happen as my bank account was much closer to $0.00 than the amount needed to drive up to Pittsburgh. I'd have to sit and watch at home. Sit at home and watch I did. I was unaware exactly of what I was seeing. I was watching my favorite hockey team... in a football stadium... in the snow... playing hockey... it was... amazing. While not a foreign concept, with outdoor games being played prior at different levels, it was the first time an outdoor game had actually resonated with me. The spectacle was real. The pomp and circumstance were unique and vast. The game was going back to the past on a grand scale. A then NHL record 71,217 fans were jammed in to Ralph Wilson Stadium in Buffalo to watch my team play the Sabres in a huge, grand event that even got the attention of ESPN. In no other sports was this possible. The NBA can't really take it outdoors, the NFL already plays in various and unique settings, and baseball? Nothing new can be done there. This was a stunning visual. Snow fell in what looked like a snow globe's imagining of an NHL game. That the game play was below average mattered not. That Colby Armstrong's early tally was as interesting as the game was mattered not. What mattered was the amazing display in front of me. And so I watched, wondering what it would be like to be there. Though sunny and warm on the New Years Day in Charleston, SC I felt the sting of the cold on my cheeks, the tingle in my fingers, and swore I could see my breath. Through three periods I took it all in, wide eyed and in awe. Even Buffalo's tying goal did not phase me. Win or lose this was something special and I felt honored that my team was involved and I was allowed to watch. And those powder blue jerseys? Wow. The magic moment? When the snow began to fall at a heavier pace and the game ended in a tie? It all seemed surreal. It all seemed fake. It all seemed scripted. The snow built up on the ice, on Ryan Miller's toque and on the fans. It looked cold. At home I didn't care. I kicked myself for not being there as each player took their turn shooting on Ryan Miller and Ty Conklin. Then it happened. So lost in the moment, the vision of it all was I that I missed exactly what happened. One minute the puck was on Sid's stick, the next it wasn't. Where did it go? It wasn't until his celebration that I realized where it went. Behind Miller. The Penguins won. It was too perfect. And I could have been there. I decided that wouldn't happen again. I needed to see this wonderful, amazing spectacle in person. Somehow. Someway. I didn't want to be an outsider anymore. Even if I were never able to play hockey outside I needed to watch it happen.